The umbrella is of high-quality. It is manufactured from a polyester material. The umbrella is 43cm in size when folded. It is the best travel companion during rainy and sunny days. The umbrella comes with various features that are bound to enhance the user’s experience. To open the umbrella, you do not need to struggle as it has got an automatic closing and opening feature. It also has got dual layer polyester canopy with matching polyester case. This stylish promotional umbrella features a unique cloud pattern on the interior canopy that makes you feel like you are under the sky when the umbrella is in use. It also has a natural wood handle with wrist strap. Two-section folding metal shaft. 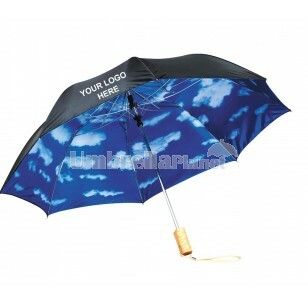 This premium umbrella is ideal for brand promotional purposes. With an option to print your company logo on the umbrella, the product guarantees positive feedback from your targeted clients. Considering that the umbrella comes at a much affordable price, it can be relieving that it will not break your budget line. Ordering from Australia is simple as it can be started and completed online. Delivery time takes up to 2 weeks upon your purchase while fast delivery can be arranged upon your request. Set-up fee costs $60, and pricing includes one colour, one position printing. Price matching is also available upon request. Umbrella Planet is dedicated to giving you fast and secure delivery within Australia. We service all states and territories including; VIC, NSW, ACT, QLD, SA, TAS, NT, and WA. Contact our sales team for exact delivery costs and times to your location.